The stage was set for an upset, but unfortunately for Diego Simeone’s men, the win never came at the Wanda Metropolitano on Saturday night. As it happened, Luis Suarez’s 82nd-minute header prevented Atletico Madrid from winning their first LaLiga match against Barcelona in seven years. The Uruguayan, who has been struggling as of late, offered a late-equalizer that managed to frustrate and hush Atletico supporters everywhere. Final score: 1-1. Yes, Los Rojiblancos are used to the suffering and will have to wait to break their negative domestic record against Barca. Atletico supporter depression aside, Simeone’s continued domestic struggles against Barca may seem strange to the neutral given that Atleti have had much success in the Champions League against the Catalans, but surprisingly, the Simeone-era has had a hard time getting the better of Barca in the Spanish top-flight and on Saturday it was more of the same (or was it?). In our tactical match preview prior to kickoff, I noted that Atletico Madrid’s past three performances against Barcelona have been largely positive; they were the better side in those performances, they dominated Barca via high and counter-pressing for large amounts of time in those matches, but just couldn’t match Barca’s efficiency in front of goal. Atletico squandered chances, Barcelona didn’t. Atleti huffed, puffed, and prevented Barca from getting into their possession rhythm, but offered little killer instinct on net. Last weekend, much didn’t change in terms of goal scoring efficiency; Antoine Griezmann missed a couple of decent chances, but the defensive approach changed a bit. How did Atletico change their defensive approach from last season? Simeone rarely gets it wrong, tactically, against Barca and at the Metropolitano the visitors were welcomed to an aggressive and physical performance from the Rojiblanco hosts. Atletico Madrid set out in their ever-common 4-4-2/4-3-3 hybrid while Ernesto Valverde’s outfit were deployed in more of a 4-4-2 (uncommon amongst BarcAjax tacticians). What made this match interesting was how Atletico Madrid marked Lionel Messi and co. In the past, and as mentioned in the tactical preview (contains loads of videos), Atleti have recently set up in a zonal/man-marking hybrid against Barca, especially at home, and often press higher up the pitch in a 4-3-3 or 4-2-2-2, but on Saturday they were more restricted to classic man-marking across the pitch when in their mid-block formation. Before we try and determine the reasoning behind this change in approach by Simeone, let’s break down how Atleti pressed. Below, the video analyzes the key characteristics and defensive strategy that Atleti took on Saturday. 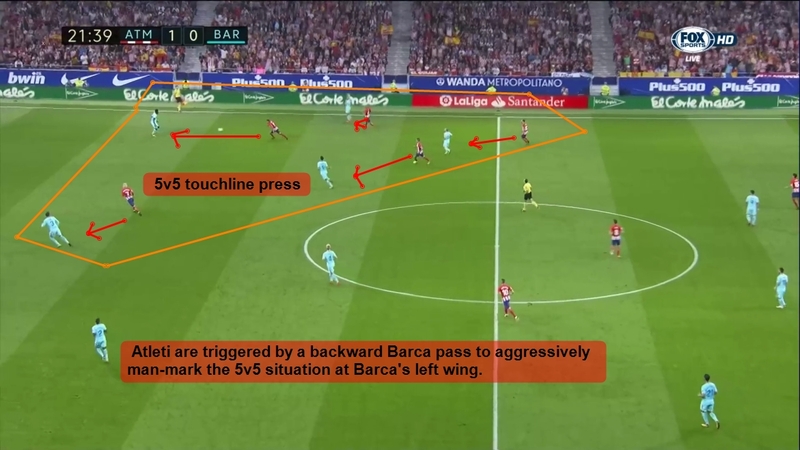 When Barca switched the play to their left side (Atleti’s right side), Atleti were then triggered by a backward pass to aggressively man-mark the 5v5 situation on Barcelona’s left wing. However, there was one occasion where Barcelona switched to their left side and Atletico didn’t trigger an aggressive man-marking press. 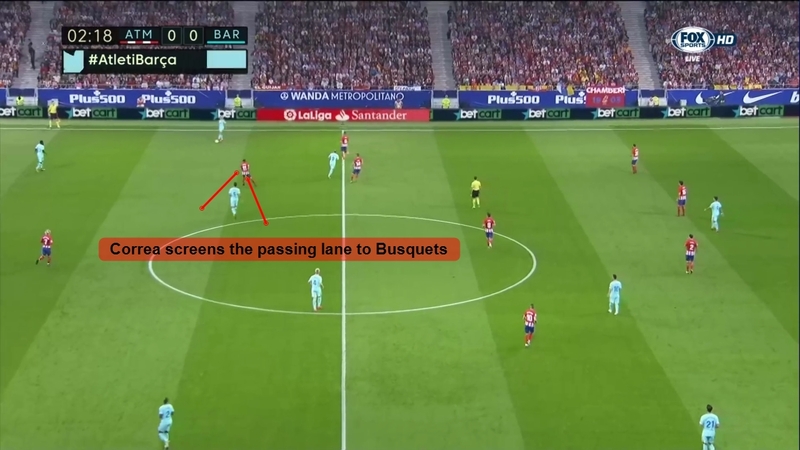 Instead, Correa screened the passing lane to Busquets while Griezmann stayed higher up waiting to press Gerard Pique in case Barca switch it back over to the right side. In addition, Saul Niguez can be seen, above, occupying the only zonal-based role out of Atleti’s forwards and midfielders. In case Correa’s passing lane screen was beaten or overloaded, Saul would be there, just behind Busquets, for cover. Naturally, you’d think Griezmann would man-mark Busquets when the ball was switched to the left given that Correa man-marked Busquets when the ball was on Barca’s right side. The two are striking partners so many would expect them to trade marking responsibilities depending on which side the ball went to. However, Simeone opted for Griezmann to always be ready to put pressure on Pique as seen in the screenshot above. Why did they change their approach from last season? Well, in the past, Atleti’s zonal 4-2-2-2/4-3-3 high-press started with an emphasis on forcing play wide by zonally playing three lines of 2 in the central axis and transitioning to a ball-side man-mark press once Barca passed to a full-back or passed near the touchline. Have a look, below, at one of the ways Atleti set up in the past. Atleti opted to win the ball high up against a side, at the time still managed by Luis Enrique, which was more direct with Messi, Suarez, and Neymar in top form. The Brazilian’s departure to Paris Saint-Germain hasn’t had much of an effect on Barcelona’s strong start to the season, but in a match like this, where Atletico are so structured in defense, it allowed for Simeone’s side to double up on Busquets and Messi in ways they couldn’t last season due to having to man-mark and double mark Neymar. Below, you can see an Atleti low-block that featured tight man-marking on Neymar from last season. Sime Vrsaljko, in the yellow circle, is disconnected from the rest of his backline due to man-marking Neymar (orange circle). Neymar’s ability, combined with the fact he played as a left-sided forward in a 4-3-3, meant that Atletico couldn’t approach the match in a more man-marking style last season due to how Vrsaljko’s man-marking would stretch out Atleti’s backline and needed more midfield cover in the half-spaces. This past weekend, however, with Barca’s 4-4-2 and without Neymar, Atleti didn’t have to worry about their backline being stretched out down their right wing; they could deploy aggressive man-marking in the central areas with only one player (usually Saul or Yannick Carrasco or both) as zonal cover or as a man-marker on Messi (as seen below). When an opponent is excellent at going direct and has ‘MSN’ at their disposal, you need to be very careful with how you man-mark them as their direct approach may bypass your midfield man-marking. Atletico didn’t have to worry about this and, as a result, ditched their 4-3-3 zonal high-block from last season. Is there a similar pressing pattern against other teams this season? Additionally, in last February’s match between these two sides, Barca used a back three which also impacted how Atleti pressed. In fact, it is becoming clear that this aggressive man-marking style, against opponents that use a back four and play a possession style, Atletico are becoming more comfortable with touchline high-pressing. Below, you can see that there’s a clear pattern between a certain pressing phase against Las Palmas and the one Los Rojiblancos used against Barca last weekend. Against Las Palmas earlier in the season. 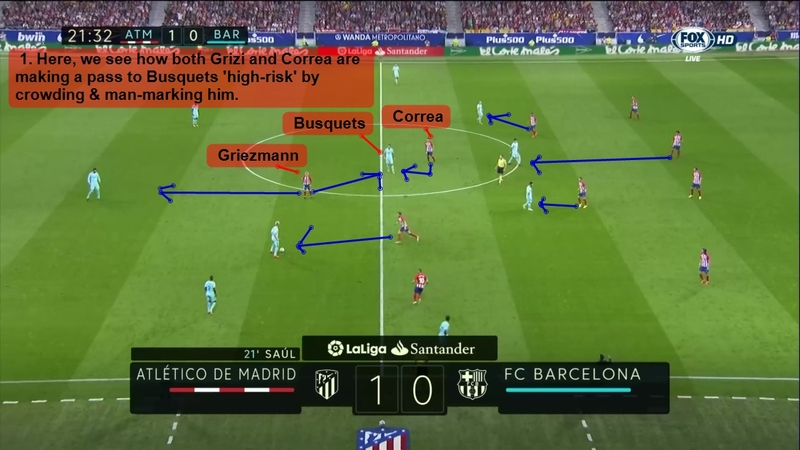 It is becoming clear that Atleti are pressing teams and forcing opponents back when they’ve trapped the opposition full-back and when the opponent uses two central midfielders in holding positions to build up from the back. One of the tactics that didn’t change, unsurprisingly, against Barca has been Atleti’s low-block. It is truly my favorite part of Simeone’s methodology and it is always a thing of wonder to analyze, in addition to their structured pressing game, how organized it is. Barcelona tied the match in the end and while Atletico fans can be frustrated with how close the hosts were to victory, they can be reassured that with Simeone anything is possible. His meticulous preparation, to me, is unparalleled. He’s a true Carlos Bilardo and Marcelo Bielsa-hybrid of a manager and it’ll be interesting to see how he sets up for Barcelona at the end of the season.